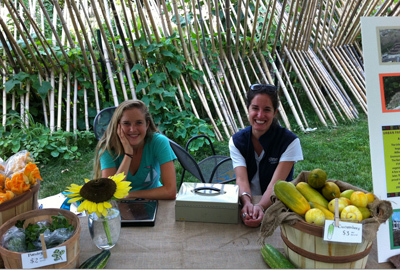 Farming interns Mia Brezin, left, and Mickey Davis, sell fresh vegetables at the Urban Farm at the Battery. “Farm fresh,” has taken on new meaning in Lower Manhattan this summer. The Urban Farm at the Battery, a public farming project that broke ground this spring on a lawn in Battery Park, is now selling its produce at a farm stand twice a week. No ordinary vegetables, these are the first grown on a Lower Manhattan farm in roughly 400 years. Vegetables are harvested in the morning, and then sold in the afternoon a few feet away from the soil they were plucked from. 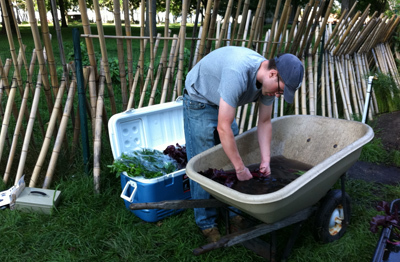 Farming intern John Bildy prepares freshly-harvested beets for sale at the Urban Farm at the Battery's stand. Opened early this summer, the stand has been so popular that a second day was added. Volunteers staff the stand (located in front of the farm near the State and Pearl Street entrance to the park) from noon until 5 p.m. every Monday and Thursday through October. Eggplant, squash, tomatoes, cucumbers, basil, okra, thyme, peppers and greens—including collard greens and Swiss chard—are now in season. Suggested donation prices ($5 a pound for heirloom tomatoes, $3 a pound for cucumbers and $4 a pound for squash) are based on costs at local farmers markets. Reusable Urban Farm bags are sold for $3. Proceeds help cover the cost of running the farm. Most people pay the suggested price, Vera said, but no one will be turned away for offering less. Leftover vegetables at the end of the day are often given away to homeless in the park. Volunteers may decide to keep the farm stand open later to make it more available to the nearby city dwellers.